After my teenage daughter came back from a mission trip in Guatemala (where she had travelers diarrhea her last day of her stay), she experienced health issues - trouble breathing (initially), which turned into daily nausea, vomiting, fatigue and stomach cramps. Conventional doctors offered no relief. As they informed me, "It is difficult to confirm a live parasite in a stool sample." After almost a year, we were desperate when we came across Grandma's Herbs Worms & Parasite Cleanse. We gave it a try. All of her symptoms resolved. Life Changing! Two years have passed and she is experiencing similar digestive symptoms and I just ordered three more bottles. We are confident this will do the trick. I first began using this protein drink when my husband, who had been severely injured in a motorcycle accident three+ years ago, began dealing with constant constipation and bloating along with severe stomach pains. He has to take pain meds for his chronic pain but the consequence is constipation. However, the bloating and pain became so intense we knew there had to be more to the story. We took him in for a colonoscopy and was diagnosed with stage 3 colon cancer. The tumor was so big it was blocking his ascending colon from allowing the stool to move easily past. This product has been a godsend!!! Using this together with vital reds from Dr Gundry and chia seeds, he now has fairly normal bowel movements. He only has two more chemo treatments left, hurray! His blood work for his last treatment showed he still had white blood cells. The nurse told us that is rare, most patients are really at the mercy of zero. I know it is because of this product together with the others I mentioned above. It has provided hime with the necessary nutrition, vitamins, minerals, etc.. I have raved about this product to many of my friends and acquaintances. I am impressed with it being sweetened with honey crystals and other natural sweeteners. Also, it tastes amazing!!! The service is fast, fast, fast and always helpful if you have a question or need something explained. I can hardly believe the effect that your products have had on my sense of well-being and recovery. I mention recovery simply because I have never had adequate access to this kind of a quality of its type EVER. After 70 years of life, one would think it possible, and its to my good and great fortune to have been introduced to Grandma's Herbs by your gentle ads suggesting that achieving health, true health, can be mine. This is now a truism for myself and I cannot be more thankful!! I've had one Vasofuel jar for a little over a week and just finished it and starting on the second. I believe your products are saving my life and that I will indeed live in to my 90s! I just ordered more of their newest product, Vaso Fuel. I tried the sample and as soon as I could get through to place an order I did. This works in a way that no other product I have ever tried in my 70 years of life by feeling a growing surge of just feeling healthy and able to get up and do. That was one sample!! I ordered 2 jars. They won't last long. I've got lots of work to do here and this Vaso Fuel more than delivered!! I am so looking forward to getting my order!! This worked for me! I would suggest it for anyone who is thinking about it. This company seem to make natural medications that do what you think they will. No fakes here! I was so skeptical of trying another product for my joint pain and flexibility after trying other products with no success. I was beginning to wonder if I was mentally setting myself up to fail. So I was pleasantly surprised when Grandma’s Herbs JOINT EFFECTS worked for me! I am recommending this product to everyone I know with joint issues! My son with special needs has significant motility issues. We were given a bottle of Super Lax by a friend a few years ago, and we have been believers since ! I have enjoyed the Slim Smart meal replacement for years! I love that I'm getting all that nutrition in a single drink. The label tells it all! I can't be without my Schizam (I love it! ), and my husband used the Super-Lax following both his total knee replacement surgeries, after suffering from the effect the pain pills had on his digestion. He used it from day one on the second knee, and had so much less trouble. It was a life saver. Thanks for having great quality products at reasonable prices! 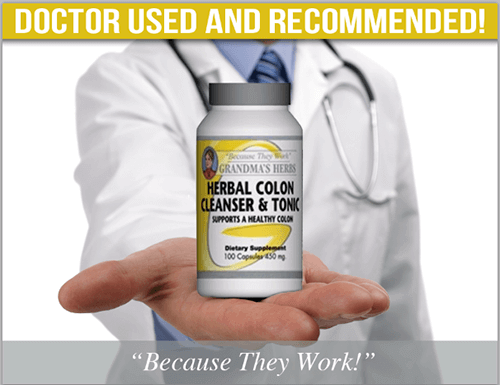 My husband and I have used Superlax and Colon Cleanser for many years. Not only do they work well and consistently, but our physicians have approved them as healthy products. I've recommended them to others who also use them. I did the parasite detox and had startling results. I had red blotches on my skin after shower for several decades, just thought it was physiological peculiarity. I had a raw irritation under both arms for years. I had a constant red, itchy and pealing scalp problem at my forehead hairline. All those symptoms vanished during the detox regimen. I'm presently using Bright Eyes both as rinse and supplement. My eye strain has alleviated by at least 70% after approximately 15 months of daily rinse and intake. Stellar stuff this Grandma's herbal wizardry! I’ve had a cold and cough for a month and nothing was getting rid of it. I started taking Grandma's Herbs Immune Enhancer, Nature’s Biotic and Respiratory Relief together and I can state I finally feel better. What a relief to feel good again. “When I first felt the on set of the flu I started taking the Grandma’s Nature’s Biotic and Immune Enhancer. I took 4 Nature’s Biotic capsules four times a day and 2 Immune Enhancer capsules four times a day. After 3 days I added the Phase I Blood Cleanser, 3 capsules three times a day and Heal 2 capsules twice a day and the Herbal Calcium 2 capsules twice a day. I started the Super-Lax formula at the same time as I started the Nature’s Biotic and Immune Enhancer. I found that if I keep my bowel cleansed out that I didn’t feel as bad. Now that I have gotten over the flu, I continue to take the Super-Lax formula to keep the bowel clean. When my grandchildren first showed signs of a cold or flue I adjust the dosage and gave it to them too. Good health to you and your family during the coming winter months. I love your Slim Smart meal replacement and the results. I truly believe the digestive enzymes and probiotic blend have helped me overcome my eating disorder. I just seem to have balanced everything out which my body needed. I was pushing 140 lbs and at only 4’ 11” tall that was not a healthy weight for me. Now after the yummy chocolate and strawberry Slim Smart shakes, I feel much better at 128 lbs! Every morning I have a Slim Smart Shake, and sometimes in the afternoon, and I really don’t even feel very hungry all day. I also drink a lot of water. It is totally amazing that I feel this good. Thank you very much for letting me know about you Slim Smart product. It works.